These days time seems so limited that I’ve not been able to post my daily bento like before so like the previous 3 in 1 post, this post will feature not one but two bentos that I’ve made for yesterday and this morning. 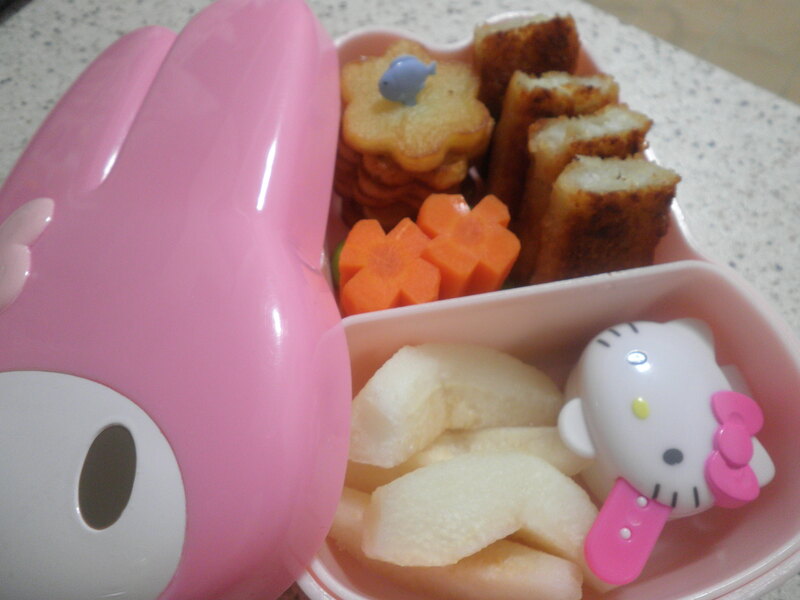 This bento consist of two fish fingers that I cut into half each, pan-fried flower potatoes, carrot flower (inspired by Sherimiya of Happy Little Bento) few edamame hidden beneath the carrots, fragrant pear and a HK container with tomato sauce. Little princess ate everything except…guess? Yup, carrots as well as edamame untouched. Sigh…. This bento’s main is the PBJ sandwich on a bamboo charcoal bread from Lavender bakery. This is a really yummy bread although its totally black! It is extremely soft and a little sweet. Heard that there’s some health benefit with eating bamboo charcoal too but don’t know exactly what kind of benefits. 😉 For today’s bento I decided to have a chinese new year theme one as my little princess will be celebrating the festival at school tomorrow. 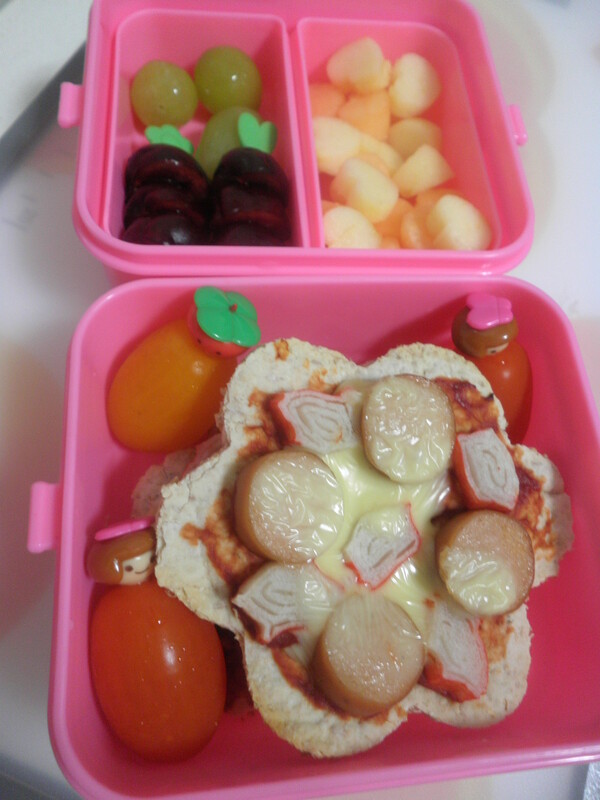 I decorated the sandwich with a cheese bowl of mandarin oranges made from carrot and spearmint leaves as well as the red fireworks made from apple skin. The tiny white specks is meant to show the sparks from the burning fireworks and they are made from cheese. I think it looks cool! Haha! 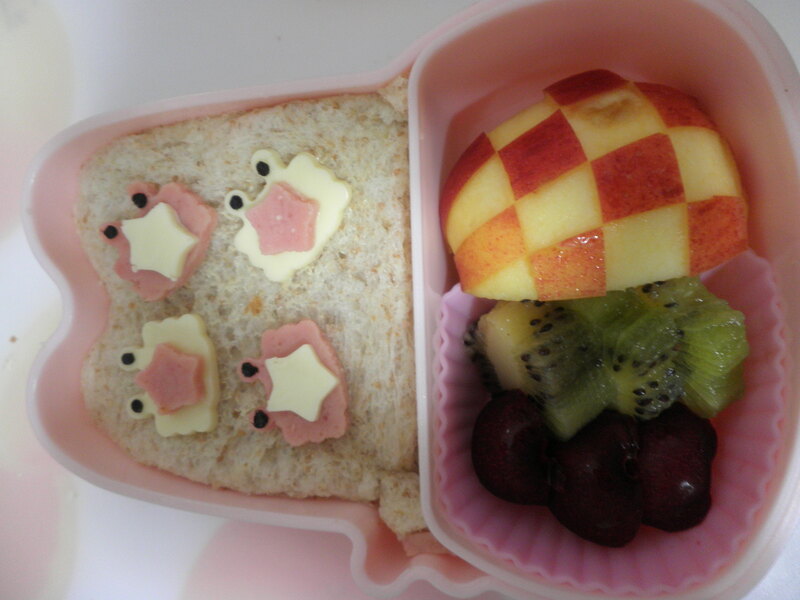 The rest of the bento consist of flower kiwi and apple slices. I did not have time to post my last Friday and yesterday’s bento so this I am putting them all together in this post with today’s bento. 😀 Please bear with me. Last Friday’s bento, featuring the “Simple Flowers”! The Yesterday’s (Monday) Bento, featuring “The Pencils”! Made a ham and cheese whole wheat bagel for princess. These days the bentos are mostly for her and her alone except this morning I made for hubs and myself too! 😀 The pencils are made from the leftover cut out of ham and cheese. Completed them with nori. The rest of the bento consist of persimmon cut out (she didn’t like it, didn’t touch it at all), fragrant pear (finished!) and a little box of raisin. 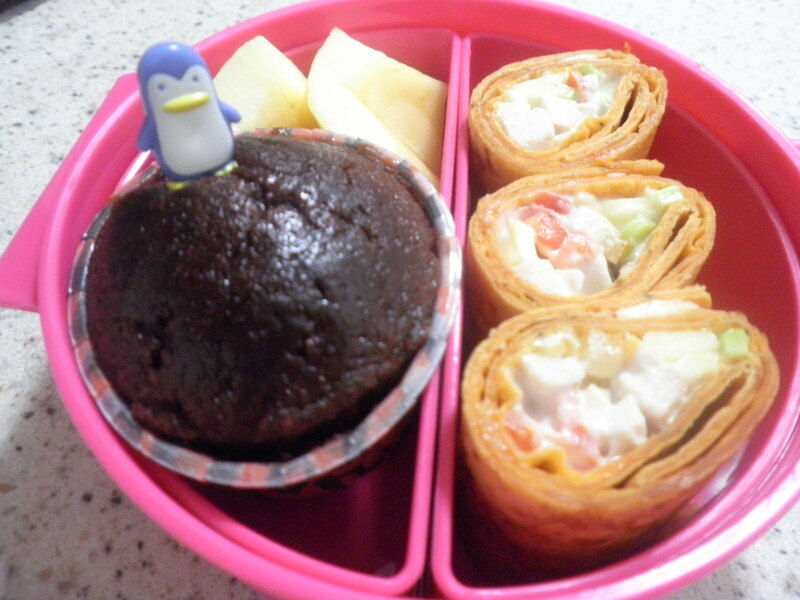 Today’s Bentos – The Whole “Rolled-Up” Family Bentos! 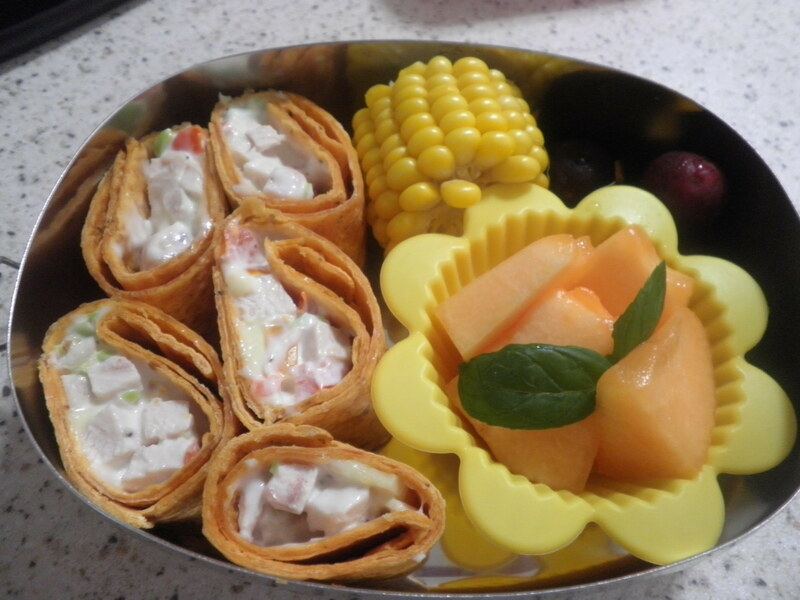 All the above bentos consist of chicken mayo rolled up with sundried tomato tortilla. My little princess ain’t fond of vegetables and she’s also picky about fruits. So I tried in this recipe to include some vegetables that she normally don’t take. I cut up tomatoes and boiled edamame into tiny pieces and mixed it with the chicken and mayo. I asked my mum earlier and she said only one was consumed. 😦 Her tongue is really sensitive. Apple slices were left untouched as well. Sigh…. She definitely finished the chocolate muffin. 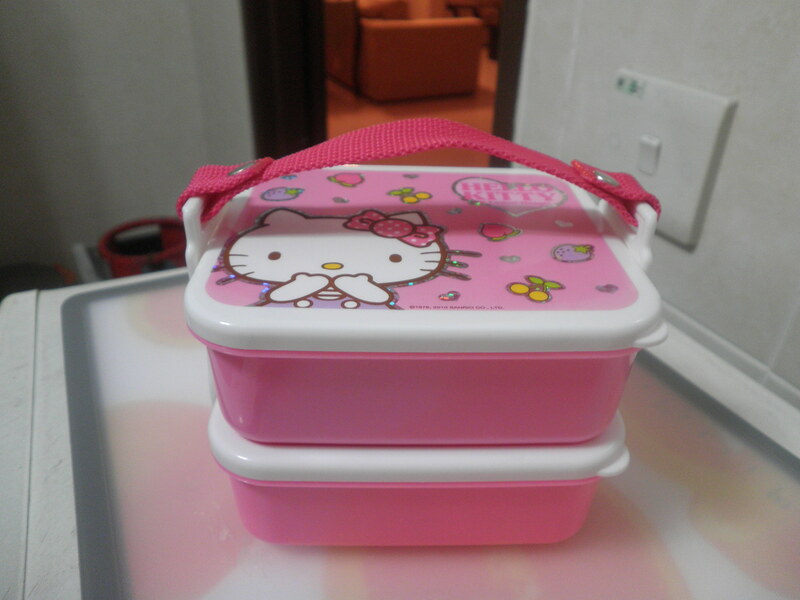 Hubs and my bentos were almost identical except for the sides. Our sides consist of corn on cob, fragrant pear, cantaloupe and cherries. Mass Produced Bunnies Teriyaki Bentos!! 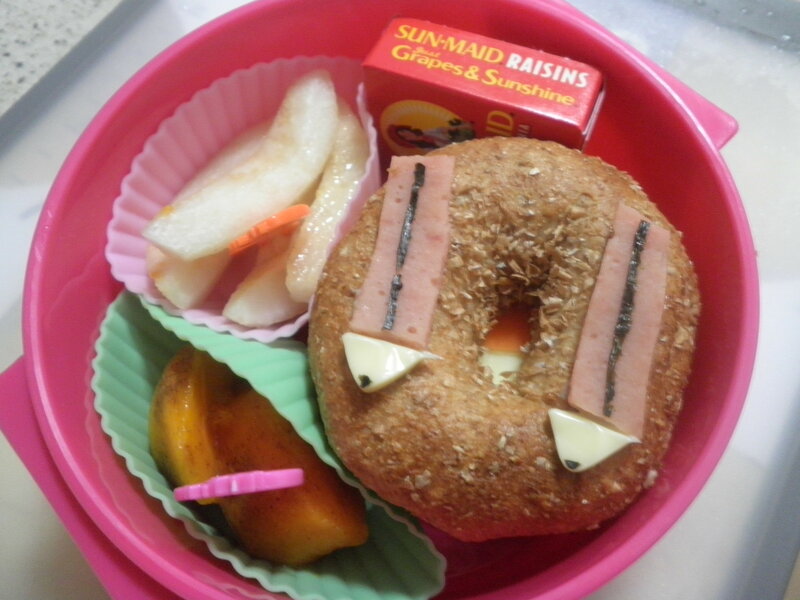 Another bunny theme bento post! I made teriyaki sesame chicken wings over the weekend for my bento stash (Yup, am better managing my bento making hobby! 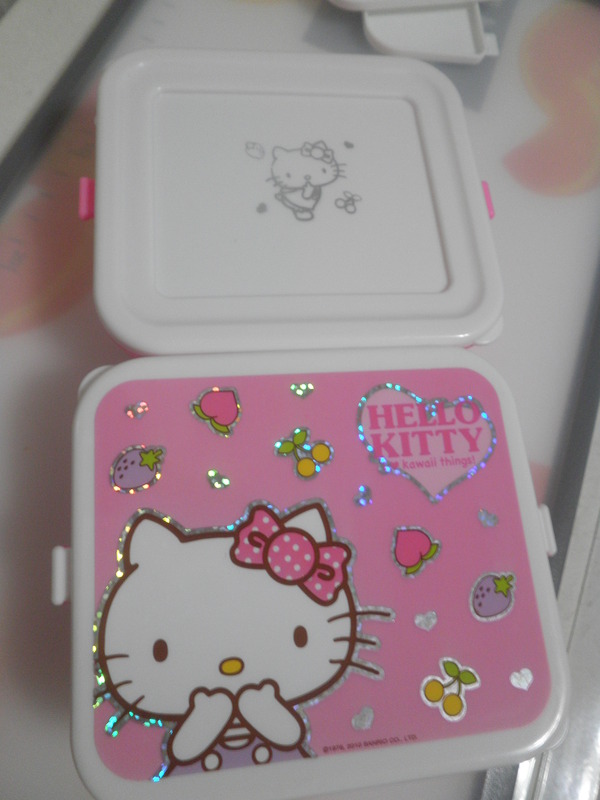 :D) and used it for yesterday’s bentos. 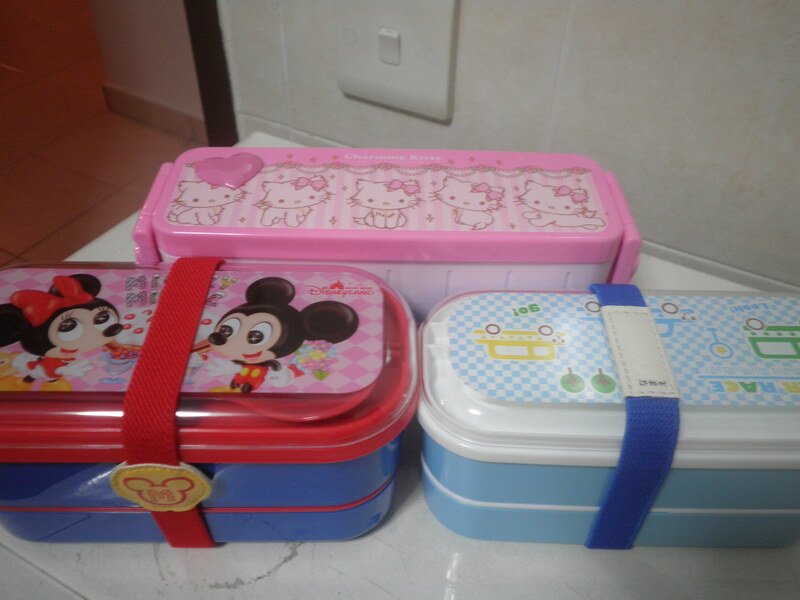 Made three bentos – one for my princess (Baby Minnie & Mickey Mouse box), one for my little nephew (Blue Vehicle Box) and one for my sis (HK Box). The mains for these bentos were the goody finger licking wings and rice with vegetable furikake. The children’s rice were formed into bunnies but can’t really see it from the pictures. 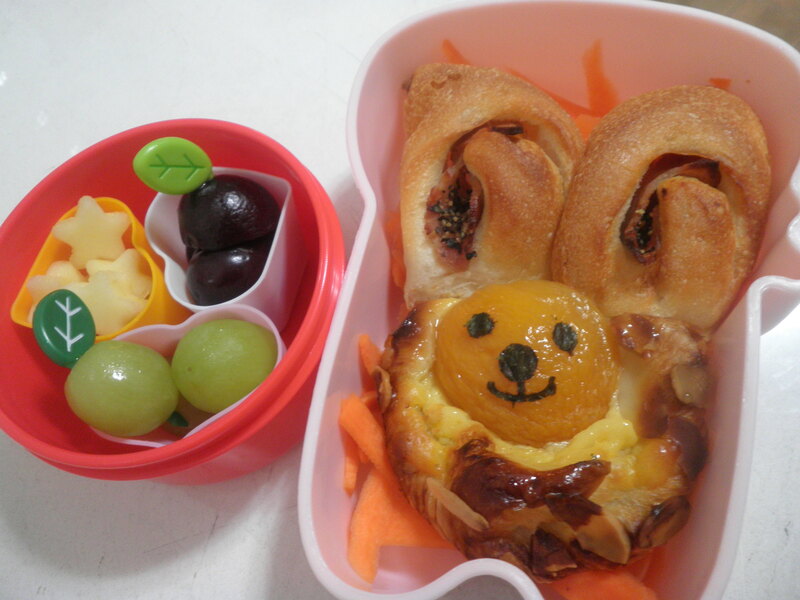 I also made another bunny for each bento from cheese with red-ish tint on the ears made from crab stick. The cheese bunnies are more apparent compared to the rice. Filling up the gaps in the main tier of the bentos are sweet pea pods and corn. In the 2nd tiers, they each had another bunny – the bunny apple!! Also there’s Korean pear, and cherries. The rest of the bento consist of heart-shaped cantaloupe (that my little princess didn’t like) and apple, skewered cherries and three little grapes. She’s a real fussy eater in a way with preference for more meat and no vegetables and only selected fruits. Like I said earlier, I will continue to persevere!! 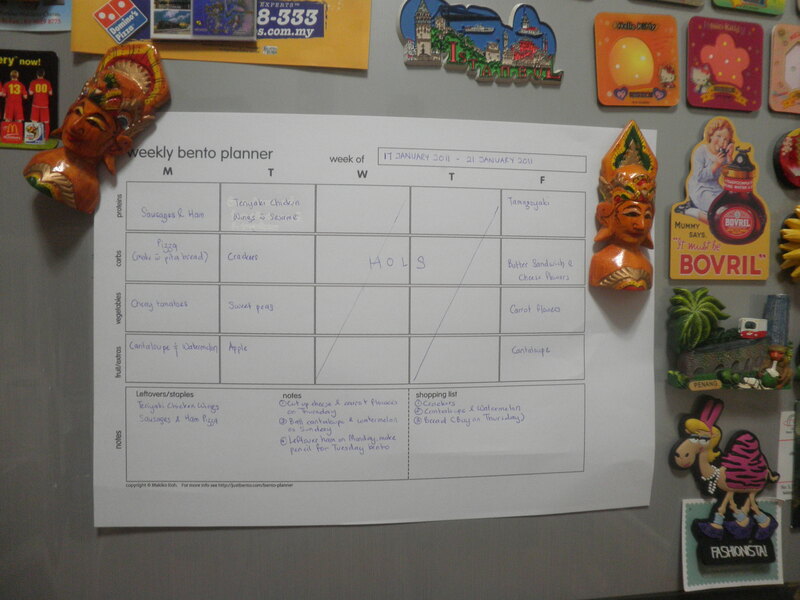 Oh before I forget, I am thankful to Maki of Just Bento for her extremely helpful weekly bento planner. I just started and it’s really saving me lots of time and allow me to plan better nutritious food for my girl. See I made mine for this week and stuck it to my fridge! 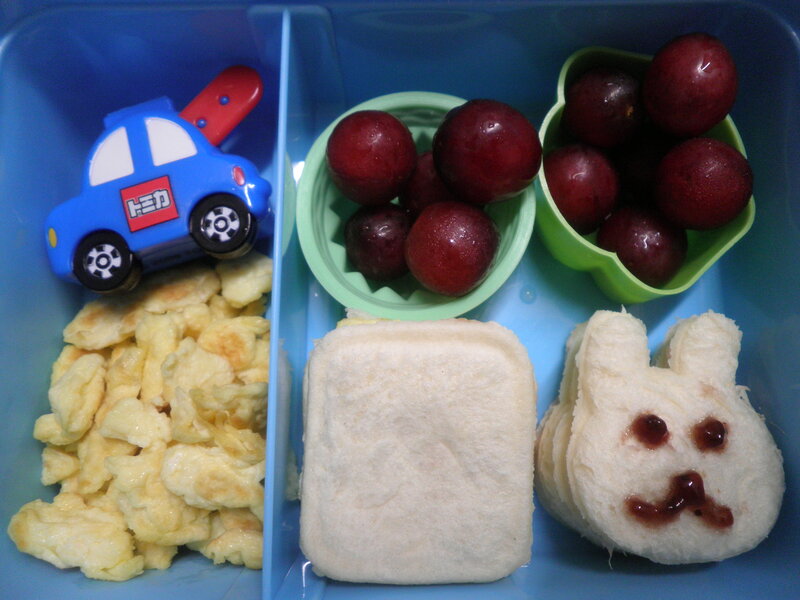 With sleepy eyes, my favourite girl asked as she woke up, “Mummy what bento did you make for Yan Yan this morning?” Things are looking so much brighter by the days. She even requested before she went to bed that I give her a piggy cheese that I made for her yesterday. I am grinning from ear to ear thinking bout her now. 😀 And to top it all, she finished her bento once again today!! Yeah! I made some beef crouquette over the weekend following the recipe from Yum Yum Bento Box and I served some of it during dinner and kept some as my bento stash. Am learning the trick of the trade i.e. 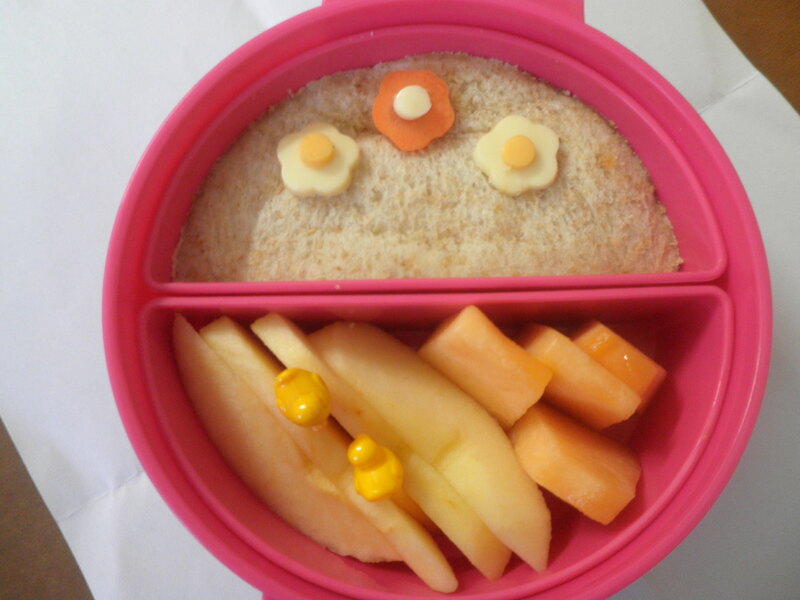 to have my own bento stash for quick access to nutritious home made food! Haha! 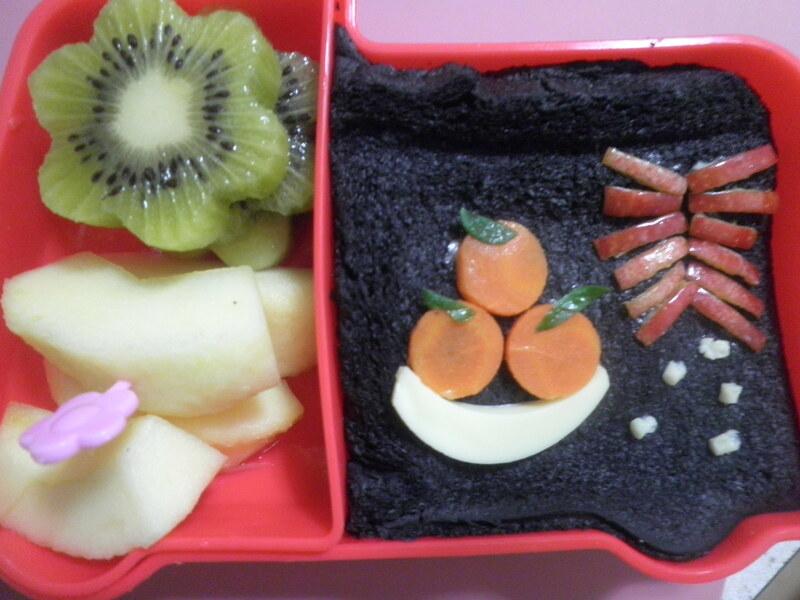 My little girl didn’t like it then but was so glad she ate it this time in her bento. I guess cheeky chick was calling out to her. 😀 Made the chick from the beef crouquette with corn as the beak, cheese with nori as the eyes and cheese for its wings. Gave her two little cocktail sausauges too. She had the the same grapes and cherries for fiber and vitamin and I promised her a treat, chocolate bourbon biscuit. Added her favourite tomato ketchup in the little chicky tube to accompany her main. 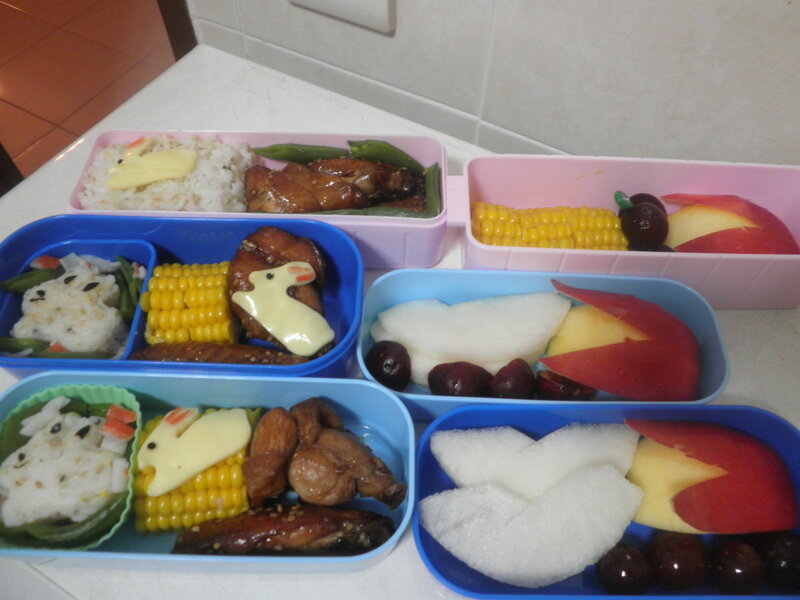 So it’s really worth it to wake up wee hour in the morning to make her bentos. This morning she woke up and I showed her the cheese piggy and she started grinning. It was a marvelous start for the day. 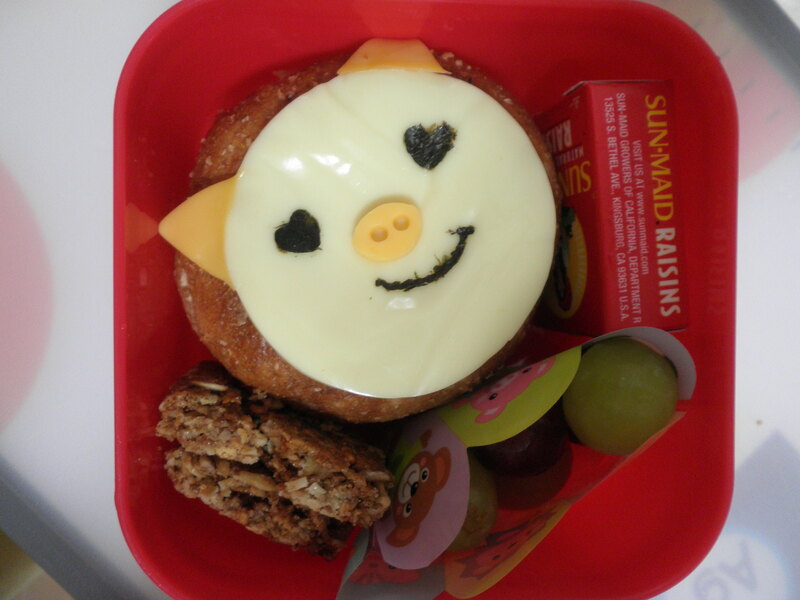 I made her her favourite whole wheat bagel with PBJ and made her the cheesy pig with love eyes from cut out from nori. She requested for grapes yesterday, so filled a little plastic cup partition that I bought from Daiso with two coloured grapes. There’s also a tiny box of raisin and two tiny cinnamon granola bits. Today she FINISHED the bento!!! It’s a beautiful day today.. La la la!! 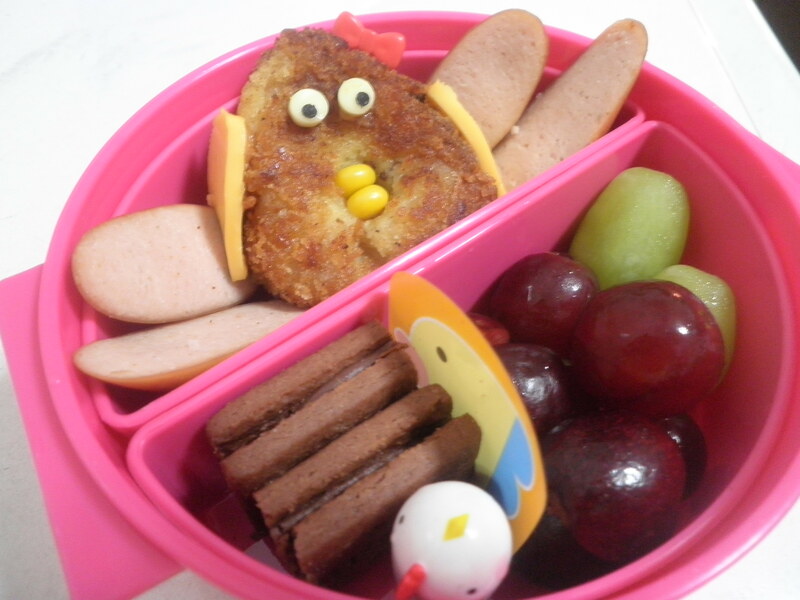 Oh, my SIL also made her son bento. 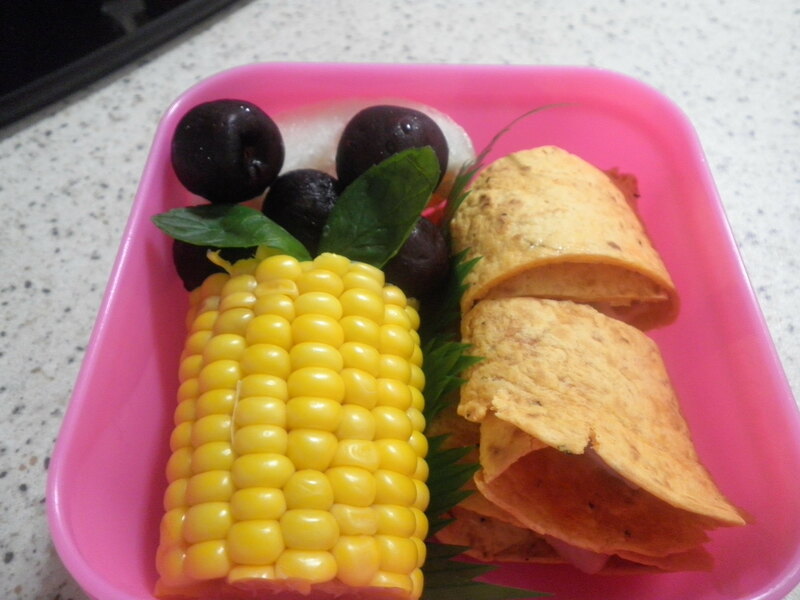 Both my nephew and daughter are in the same class and it’s their first year and as all caring mother, she wanted to provide her son with healthy food too. 😀 I congratulated her on her attempt coz it’s real pretty though she has just started. 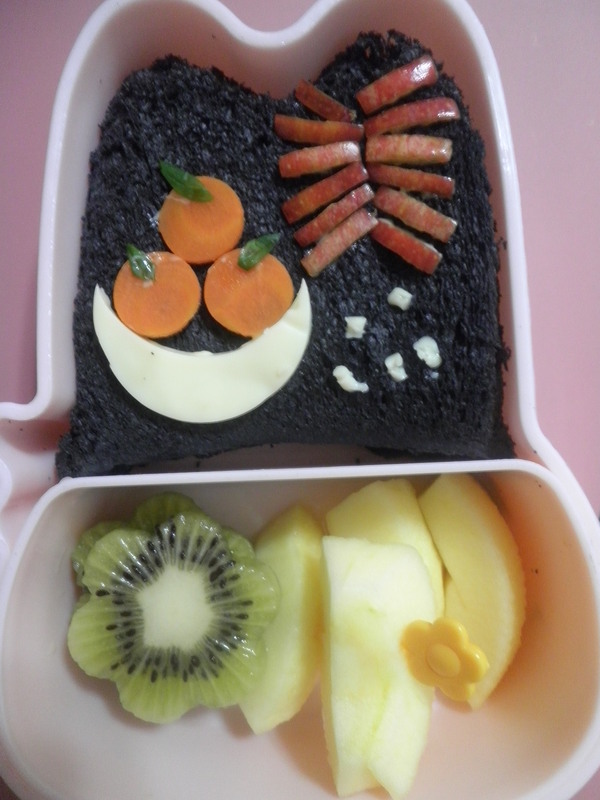 🙂 Here’s Kitt Kitt’s bento this morning.